Living West of Boston -- Concord, Wayland, Sudbury, Maynard, Stow...: Wayland Real Estate - Q1 Homes Sales and Prices Up! Wayland Real Estate - Q1 Homes Sales and Prices Up! 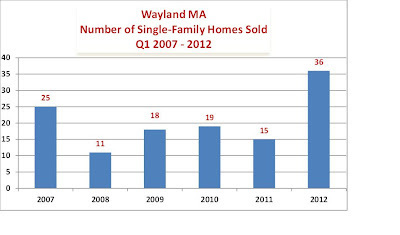 The number of single family homes sold in Wayland during the first quarter of 2012 surpassed the number sold during 2007 which was considered the peak. Median and average prices are also rebound. (See charts for year to year comparison). The current market is very active. There are a few more homes for sale than last year – 93 compared to 89, however, 15 of those properties already have accepted offers with contingencies waiting to clear and there are an additional 31 with sales pending. Both median and average list prices are less than last year and lower prices are attracting more buyers. The median list price is $724,000; last year it was $748,000. The average is $1,096,925; last year it was $1,271,085. The condominium market is also active. There are 16 condos/townhouses with accepted offers and there are 10 sales pending. So, while it’s easy for sellers to get over-confident when they hear the market is improving and even some multiple offers, a property that is incorrectly priced will not sell. 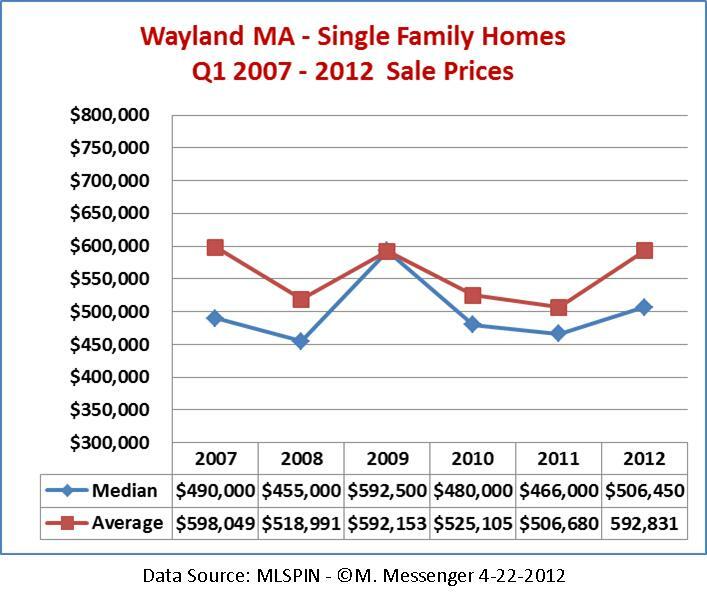 On the other hand, buyers who want to live in Wayland need to be prepared to step up when they find a good value because those properties are likely to attract other buyers quickly.